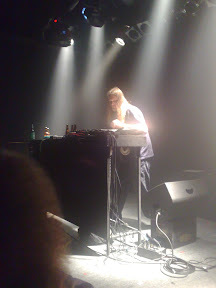 Went in to see Venetian Snares last night with The Very Understanding Girlfriend, the second time we have seen him this year (the first time being at Bang Face). Even though I was wearing earplugs I still have a faint ringing this morning. Not good at all really. The gig was great, very hectic though as usual I spent a good portion of time sitting at the back, not wanting to get in the way of all the happy kids. I was reminded of this year's Wimbeldon, where the best seats on Centre Court were given to a group of old women in wheelchairs, wrapped up in shawls, whom the cameras would occasionally catch drifting off to sleep in the middle of yet another Nadal match point, oblivious to all the tension and excitement around them. That's what earplugs normally do for me, bring the gig down to tolerable and less permanently debilitating levels of noise. I've got a gig tomorrow night and I hope the ringing stops by then. God knows what I'll end up playing if it doesn't. The McWhirters, mmm, they would record it.